Unroll dough; separate into breadsticks. Loosely rewind each into spiral. Stick long-handled fork through 1 side of each spiral. Bake 6 to 8 inches from hot coals for about 10 minutes or until browned, turning frequently. On small plate, combine sugar and cinnamon. 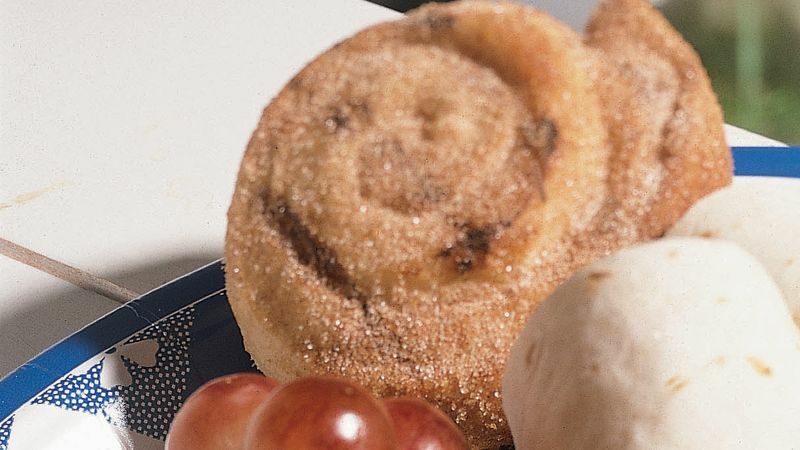 Brush rolls with melted margarine; roll in sugar-cinnamon mixture. Use two long clean sticks or metal skewers with wooden handles in place of each long handled fork to hold the dough over the campfire. For best results, be sure to keep the can of refrigerated dough chilled (40°F.) in the cooler or refrigerator until you’re ready to use it. These twirls are fun to make around the campfire at night. Store cooled leftovers in a covered container. For a quick breakfast, dunk twirls in hot cocoa or coffee.